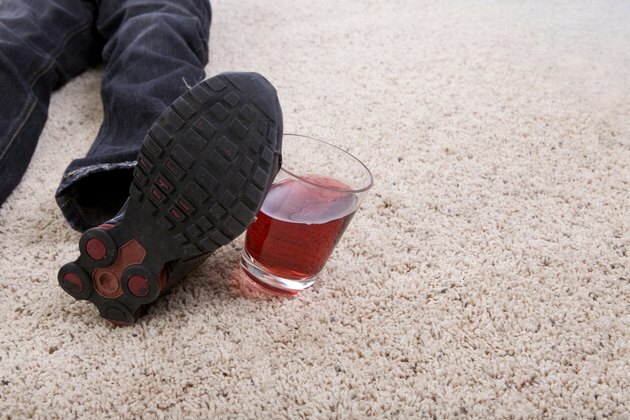 Vodka comes in handy as a stain remover for fabrics, upholstery and carpet, no extra chemicals required. Inexpensive vodka works just as well as the good stuff, but stick with unflavored vodkas for best results -- any additives such as sugar may hinder your cleaning efforts or make the cleaned area sticky. Vodka eradicates stains caused by grass, ink, red wine and some foods. Foot knocking over glass of juice. Blot the stained area with a soft white cloth, if the stain is fresh or still wet, to absorb as much as the offending substance as possible. Don't rub a wet stain or spill, as that may spread the substance and make the stain worse. Pour some vodka onto a soft white cloth and dab it over a stain on upholstery, on carpets or area rugs, leaving the wet cloth atop the stain for a minute or two to loosen it. Allow the area to air dry. Remove mold or mildew stains on on bathroom tiles by wiping them down with a sponge dampened with vodka. You can also blot food, ink or grass-stained clothes with vodka before washing. Vodka works much the way rubbing alcohol does to remove some types of stains, as it is another form of clear alcohol without additives. Can Vodka Be Used As a Disinfectant? How Do You Get Pickle Juice Out of a Carpet?